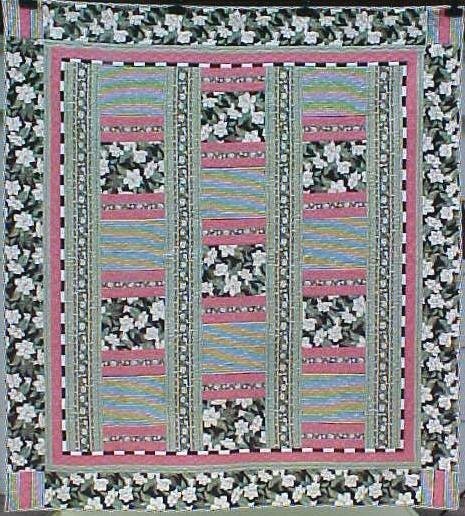 Offering this gorgeous queen size quilt; measuring 82 inches x 92 inches, made in a modern rectangle and strip pattern, beautiful large creamy white magnolias on black with just a touch of soft pink; black and creamy white stripes; soft rosey pink blocks and sage green border strips with magnolias. 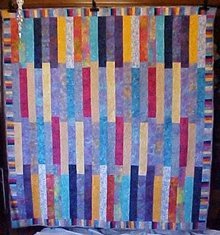 I apologize that in the full photo, the black and creamy white stripes may look like blue / yellow - there is no blue or yellow in this quilt - the closeup photos show the true colors of the stripes. 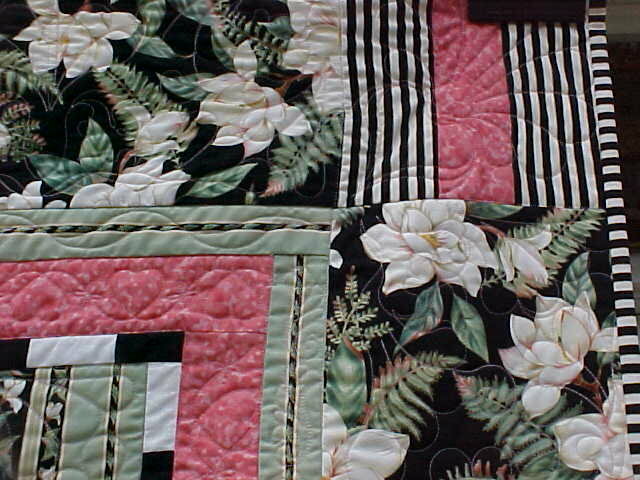 Borders are a thin black and white check, soft rosey pink, sage green and black with large creamy white magnolias. Binding is black and creamy white striped. Backing is a soft tone on tone sage green floral print. 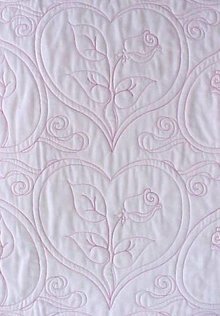 This was custom quilted on our Statler Stitcher long arm quilting machine, This was custom quilted on our Statler Stitcher long arm quilting machine, here in Ohio U.S.A.. Stitched patterns include hearts, ribbons, feathers, florals and more using a soft pink verigated thread. 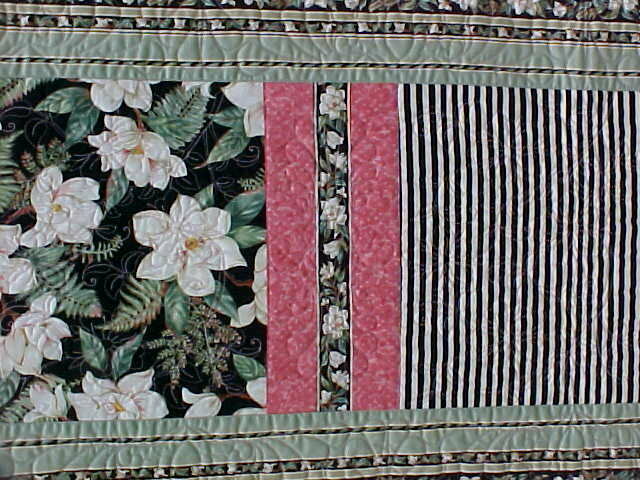 All fabrics used are 100% cotton, quilt shop quality. Batting is Hobb's Heirloom, 80% cotton, 20% poly blend. Stitching is 12 stitches per inch, top quality thread. 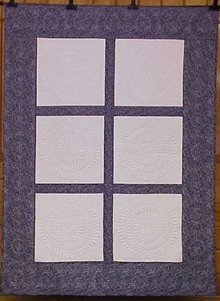 A beautiful, quality made quilt. Made in Caldwell Ohio, you will not find this one in any store! It is made to be used, and to last many years, and to be machined washed on a delicate cycle if you have one is best. 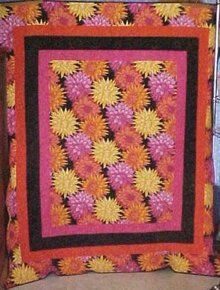 Great for your bedroom, guest room. 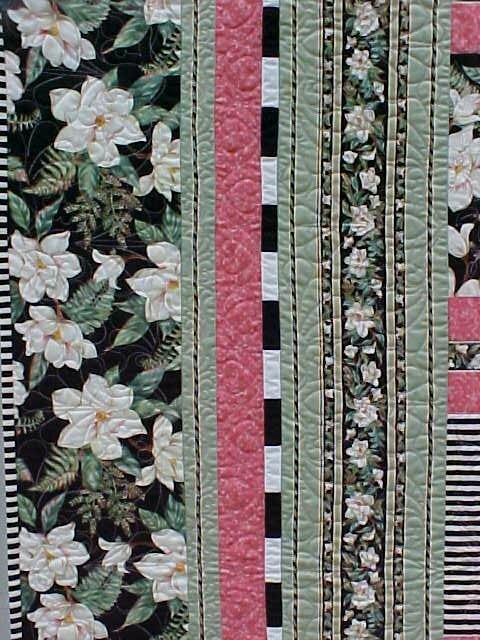 Items Similar To "Quilt Queen Size Magnolias Stripes 82 x 92 inch"